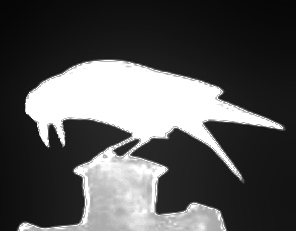 Most people think crows are black, and most are. 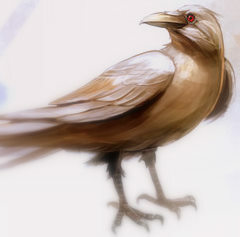 A number of species in the genus Corvus, however, have extensive white in their plumage. One of my favorite species the White-necked Raven, Corvus albicollis, of Africa, for example, has a white collar (in addition to its way cool bill). 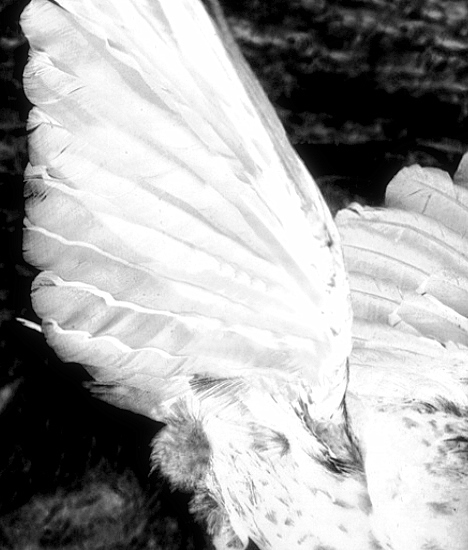 Some other species have extensive white on other parts of their bodies as well. Even those species that normally are black may show patches of white on parts of their body, or may be completely white. 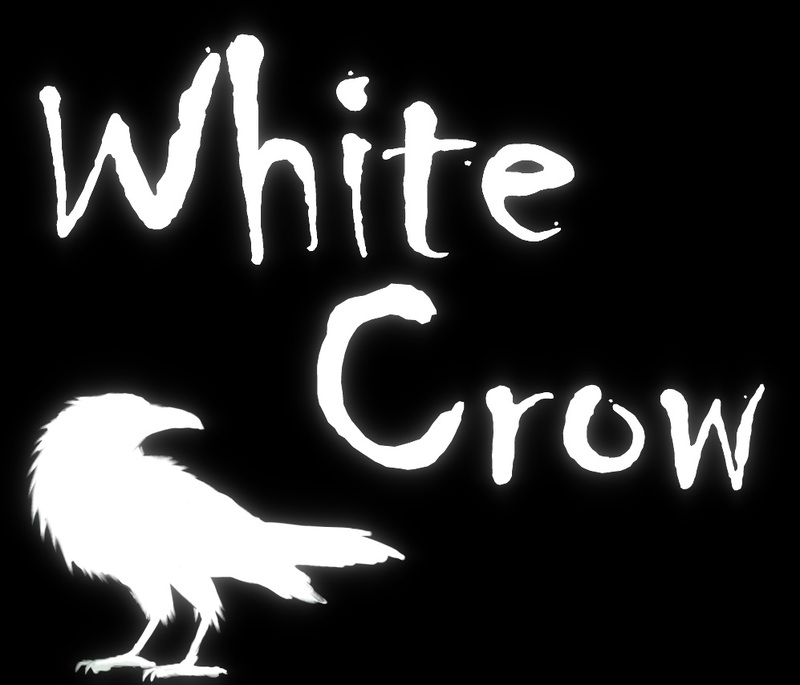 Although I have had several young crows with white in the wings in a single nest , I have not found white to occur in the wings of young of the same adults over successive years (but it could happen). I have a few families that have had multiple broods of young with white spots on their toes, but the numbers are small enough that I cannot distinguish them from random occurrences at this point. 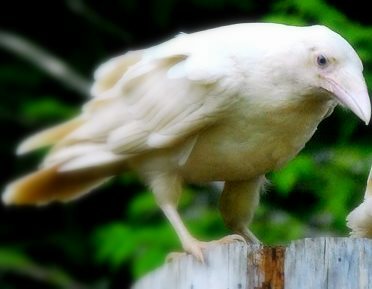 Here is an example of a nearly completely white young American Crow photographed by Maxine and Jim Harwood of Piedmont, Ohio, June 1998. It was a recently fledged youngster. The Harwoods report seeing two white crows the next day, probably this one and a sibling. Notice on the one picture that the back is not completely dark. Also, despite the red from the flash, the iris was not pink, but was normally pigmented with blue-gray. 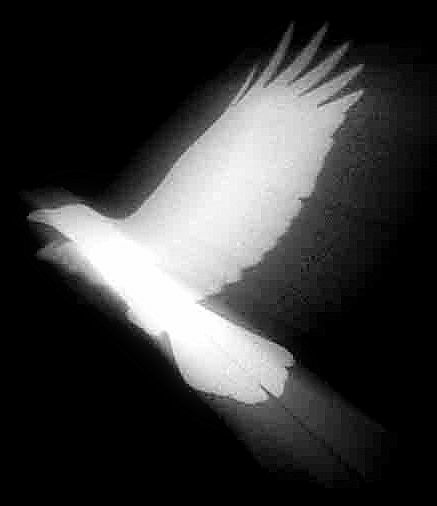 Another white crow picture sent me recently by Burr Cornell of Endicott, NY was of a bird seen in Vestal, New York on 25 October 1998. 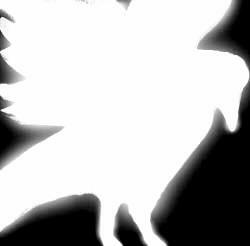 It shows black in the face and in the wings. 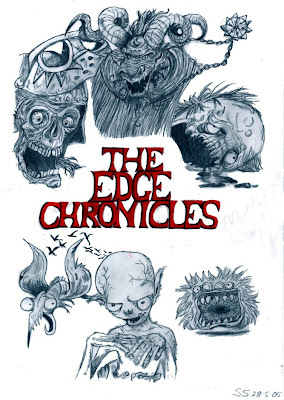 The Edge Chronicles is a young-adult fantasy novel series by Paul Stewart and Chris Riddell. 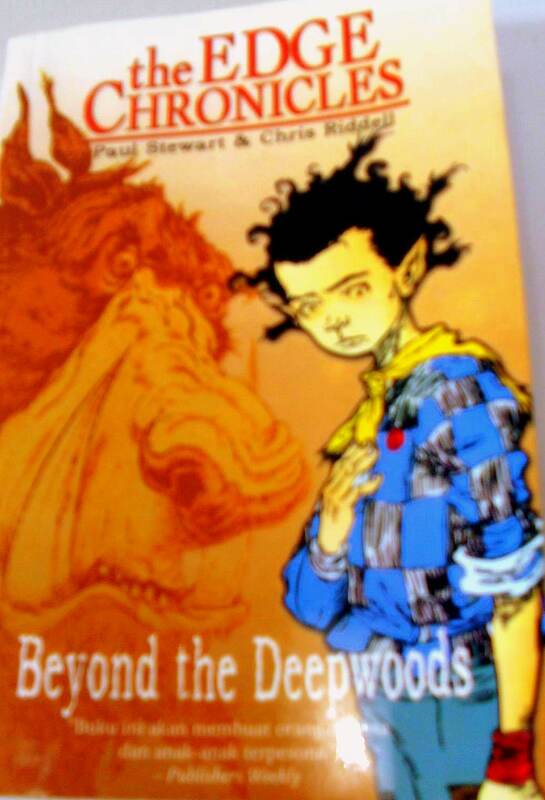 It consists of three trilogies and three additional books. Originally published in the United Kingdom, this series has since been published in the United States, Canada and Australia. To date, more than ten million copies of the novels have been sold. The series is set on the Edge, a huge rocky outcrop in a vast expanse of Open Sky which careens into rocky edges which plummet into an endless pit. The Edge is made up of many different environments, the first of which is the Edgelands, the very northern and southern edges of the outcrop. It is a barren rocky place forever clouded in mist, haunted by demons which can possess people and slowly drive them insane with ghostly visions of ones enemies. The Edgelands are feared because they are part of the Gloamglozer's territory. The Gloamglozer is universally considered the most feared form of life in the Edge. It borders the Mire to the east, the Twilight Woods to the north, the Edge and the Deepwoods to the west. In the tenth book of The Edge Chronicles, there is also a terrain known as Everlasting Hills, another as The Phraxfields, and the Silver Ravine. The Mire is a large, toxic wasteland between Undertown and the Twilight Woods. It was the dumpsite of Undertown's chemicals and was covered in bleached white mud. 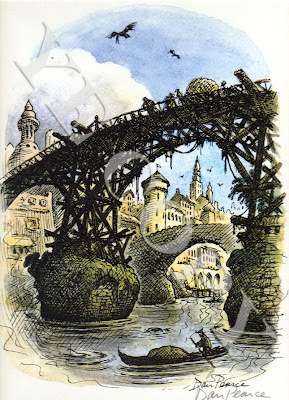 Before the construction of the Great Mire Road, the trip across the Mire was treacherous. The toxic blowholes and quickmud often killed an unfortunate traveller, but the natural hazards of the Mire were not the only dangers posed to travellers. Criminals lurked in the Mire; driven there by insanity and a lust for wealth gained from theft, and an easy living compared to the harsh streets of Undertown. Most inhabitants such as Mire-clams, Mire herons, Mire Mistwraiths, Mire-Monsters, Mud-demons, Muglumps, oozefish and the white ravens, of the Mire were bleached as white as the mud around them. By the time of The Immortals the Mire is a large green plain home to many birds. The Stone Gardens was a region beyond Undertown, close to the farthest tip of the Edge. During the Quint and Twig trilogies, buoyant rocks grew in the Stone Gardens, pushing up rocks above and creating rock stacks. The White Ravens resided there and screeched when it was time to harvest the rocks for use in sky ships. In the Rook Trilogy, stone-sickness struck the Edge, and the Stone Gardens no longer produced buoyant rocks.